The final cost of the Scottish Parliament building at Holyrood has been put at £414.4m. MSPs were given a final report on the "Holyrood Project" which showed that the price tag was some £16m cheaper than expected. Presiding officer George Reid also announced that the building's contractors will not be sued over construction delays. The constuction of the Holyrood complex has been formally declared complete. However, Mr Reid said legal action would be taken to recover the costs of a broken beam in the main chamber. The most recent estimate of the building costs had been £430.5m. Bill Aitken MSP, Scottish Conservative chief whip, said nobody had come out of the row over the Scottish Parliament with any great credit. "But at least some sort of grip was eventually exercised. The recovery of £16.1m is very welcome," he said. An inquiry into the problems with the construction of the building was held by Tory peer Lord Fraser. He found systemic failures but no single "villain of the piece". Speaking on Wednesday, Mr Reid said: "As Lord Fraser made clear, everyone involved in the project - consultants, contractors, MSPs, staff - might have managed it better. "In making our announcement today, we are not trying to sweep past problems out of the way. "The most we can claim is a steely determination to get a grip on the project - to move us in and then to move us on - and never to give up on our dedication to get back what we could for the public purse." A White Paper published shortly after Labour's 1997 general election victory initially put the construction cost of a Scottish Parliament building at between £10m and £40m. The following year, Holyrood was named as the site of the new parliament and the search began for a designer. By this stage, the cost had gone up to £50m. The same year also saw a decision to use the "construction management" method for the building, in which the client has full control but also carries all the risk. After the first Holyrood election in 1999, the then Scottish Office handed responsibility for the project over to the Scottish Parliament Corporate Body of senior MSPs. The newly-elected parliament voted by 64 to 61 to continue with the project after First Minister Donald Dewar put the cost at £109m. Costs rose, timetables were extended, MSPs came and went in the 2003 election, and still the building at the bottom of the Royal Mile was unfinished. 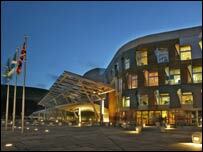 MSPs finally moved into the new building in September 2004 and it was opened by the Queen the following month. By then it was three years late and had cost about 10 times the original price tag. In recent years the building has picked up a number of accolades, including the UK's richest architecture award - the Andrew Doolan award, which is presented by the Royal Incorporation of Architects in Scotland. Was the Holyrood building value for money?